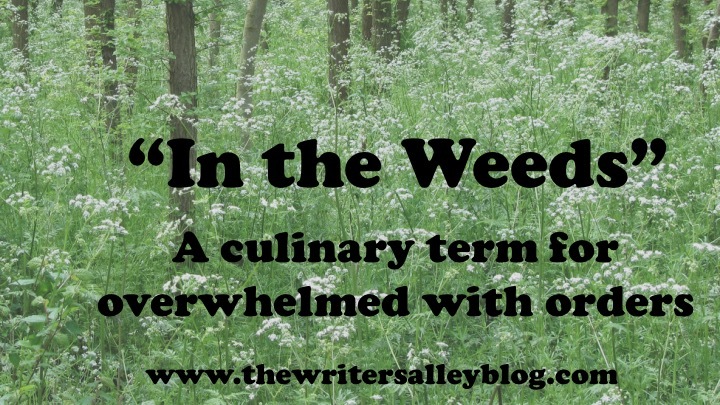 The Writers Alley: "In the Weeds"-The Rush That Rewards-Even if You Have Allergies! "In the Weeds"-The Rush That Rewards-Even if You Have Allergies! 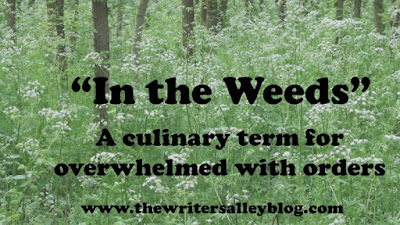 "In the weeds" is a culinary term chefs use when the kitchen is overwhelmed with customer orders (tickets). A whole culinary vocabulary kicks into action revving up slicing, hot pans moving behind chefs who are busily pivoting to counters to reach what they need. What appears to be mass chaos is actually a well organized panic. When the "tickets" are caught up, the chefs refill supplies, slicing, dicing, browning etc. No rest, but a time to regroup and feel good about the job. I thought writers could appropriate this term. Sure seems like we walk through the weeds sometimes, right? Most of us hold down a day job while writing and marketing. If only we could hire a chef to make dinner for the family! When we look back at these moments--these frantic, I'm never going to get through this moment--we can see booming rewards and remember the sensation of rush. 2. Don't skip any steps. 4. Keep the to-do list close by. 6. Tell all your friends and old enough to understand family members. On a regular basis I see writers post they are going off line due to a deadline. Below their FB post, I see tons of well wishing comments. The benefit of letting everyone know is: no one will send a message or call asking if you are well, if you have a problem...etc. They all know you are working at hyper speed to meet the deadline. BTW this can also be a self made deadline. One where you decide x number of words/editing must get done. 1. Your mind will be in a whirlwind. Take time to debrief. Journal, soak your neck muscles in a long, hot shower, get away from your workplace, find something/someone that will make you laugh. 2. Don't fret if the next day you haven't a clue what you did. BECAUSE you DID do your best in the weeds. After the calm comes, take a look at the awesome list that you checked off. Feel free to celebrate. 3. Don't second guess yourself or your work. If you absolutely MUST edit one more time, then do it ONE more time. Get the project our of your hands. 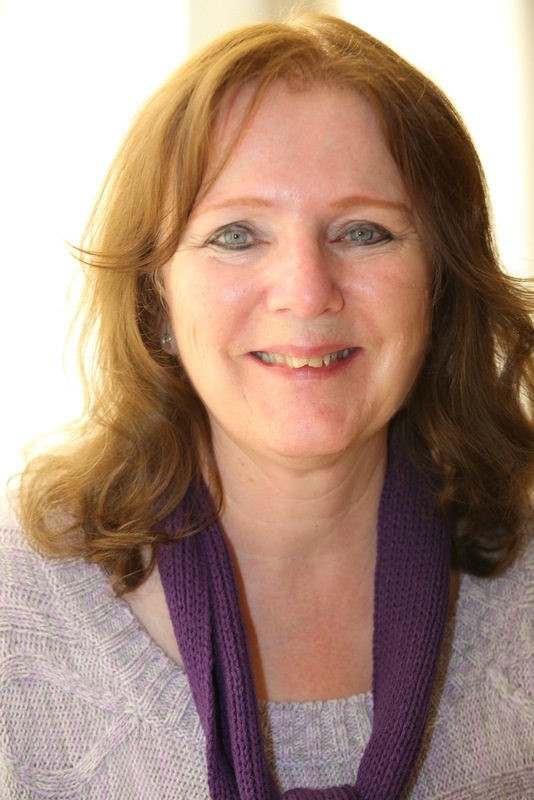 Send it to a critique partner if you are unsure the project is ready to go to an editor or agent. When the project comes back, you will be refreshed and ready to take an objective look. Quality is CRUCIAL. But no one will read the story if the send button isn't pressed. Chefs never know when they will be thrown into the weeds. A day's shift can go by with few orders. But then an invisible town cryer hits the streets and calls everyone to head for the restaurant. The hype is so stimulating. None of the cooks are hungry or thirsty during this blitz. The head chef even has to remind his workers to drink. Keep hydrated. Hurry. Order up. Service! A writer's walk through the weeds is just as exhilarating. Muscles tense, words fly, the computer screams for the power cord to be plugged in, doubts are squashed, progress is made, the microwave beeps-coffee/tea is reheated, pumped to finish. Hurry. Story is finished. THE END. Sometimes I think we need to just schedule a day in the weeds. What do you think? Mary, I really love this and can SO relate! One thing I enjoy (and I use that word loosely) is not having the luxury of second-guessing myself while in the weeds. Out of necessity, I trust my instinct more readily. Most often, the results are spot on and there's less post-editing to do than if I spent a leisurely session on just one scene. Heh, Teresa! Your post yesterday was awesome. Re the necessity of trusting our instincts--So true, and very encouraging. There is a saying we teach/write about our own weaknesses. Yep...this is mine. I'm an inch-worm writer most times. 2 forward-1 back. Someday I'll graduate to 3 forward! i had some hefty goals i wanted to reach prior to surgery, alas, i didn't get it done. I focused on getting blog posts queued up (and set through the end of the month, thank-you-very-much!) was also hoping i'd feel up to at least *some* writing while in hospital—not so much! meh! all this to say, i've lost serious time—BUT, i also know i can and WILL catch up, and yes, it will involved some FB posts to that effect. i usually mention i'm headed for "the cave" (complete with a meme with a pic of a cave) and will go offline. i resurface every hour or so, OR evey 1000 words, then get back to it! next week, WC here i come!!! LOVE this Mary!!! I'm in the weeds today... so need to skedaddle! HAHAHA! Great post, Mare! I have so felt much of this...and I have found the best thing I can do is get it out of my hands after I have thoroughly worked in the weeds and found some peace. I could literally "chop" and "stew" to death, and that just steals time from my other obligations--like family! Thanks, friend! Sweet Krista, I knew you are...praying for you. And so happy you took a second to join us. Can't wait to hear updates.